The Golden Eagles RC Club was formed as a way to bring RC modelers together… to share our fun and our friendship. Most RC clubs have a loose organization lacking focus… or tight rules that work against the best interests of the flyers. The Golden Eagles are very focused… on fun, on community, and on future growth in our membership numbers and growth in the quality of our infrastructure at the field. 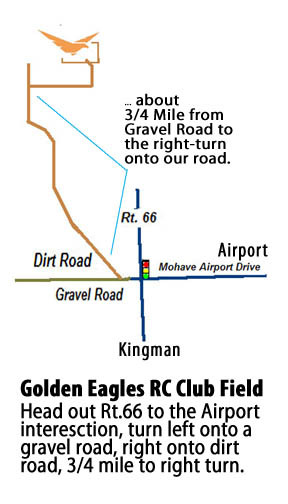 The Golden Eagles RC Club of Kingman, AZ, is devoted to RC model flying. Our bylaws are written so as to allow the Club to be FOR FLYERS and BY FLYERS. Certainly we encourage supportive RC enthusiasts and local businesses and organizations to become members in the Golden Eagles, but, most of all, we are FLYING. Flying members can become “voting” members and have a vote in the direction of our organization. … but… they don’t HAVE to be voters… any RC flyer in good standing with a current AMA number can join our club and enjoy our facility… no pressure and no strings attached… just come out and fly and join the camaraderie! Those flyers who desire to contribute to the management of the club and become a voting member may make application to do so. Come on out… join the guys (and gals) out at the field! … Rather Racing or Sport Flying, I am sure that you will have a good time when visiting our Field.